As spring approaches, it’s time to get ready for all those vendor events again! We all know that events can be pretty tiring because there is so much work that goes into it. At the same time, it’s a great opportunity to meet new people and hopefully grow your business, which is why you put so much effort into it in the first place, right! I wanted to give you some Helpful Tips that I hope will help you make the most out of your upcoming events this year. Whether you have done events for many years or are just starting out, you want to be the vendor that people remember and want to do business with. So how are you going to do that? First of all, the look of your booth is the first thing that will attract people to you. Make sure the colors or style reflects your brand. If your business is known by blues and greens, then decorate your booth with those colors. Have your logo printed on the tablecloth that customers will see. Bring all your promotional materials and have attention-grabbing signage and decorations. If you are selling products, place your items at different heights to add visual interest. Allow people to try things on or sample your products and have prices clearly marked. Offer specials and discounts such as buy one get one half off or spend $50 get a free gift, etc. You MUST have a way to get those new contacts and leads for your business. Will you have a drawing for a prize? You can tell everyone that there is no obligation and they don’t have to be present to win. Provide drawing slips that ask for their name, address, phone# and email and what ever additional information you need. This is also a great time to have a conversation with them while they are at your booth. Remember to smile, ask questions that get them engaged in conversation, and be friendly, even if they don’t seem interested. They will remember you. One of the most important things you have to do after the event, is to call your leads within 24-48 hours to follow up. People lose 10% of the excitement each day so if you wait a week to follow up they are already going to be 70% less excited than when you spoke to them. Don’t forget to invite your current clients/customers, friends, family to the event and offer them a special if they introduce you to someone new at the event. It is really important to stand at your booth or table when you have customers. It will definitely encourage interaction if you smile and make eye contact with them. If this feels uncomfortable for you, straighten up your booth, arrange things on the table, etc. Basically, just busy yourself. 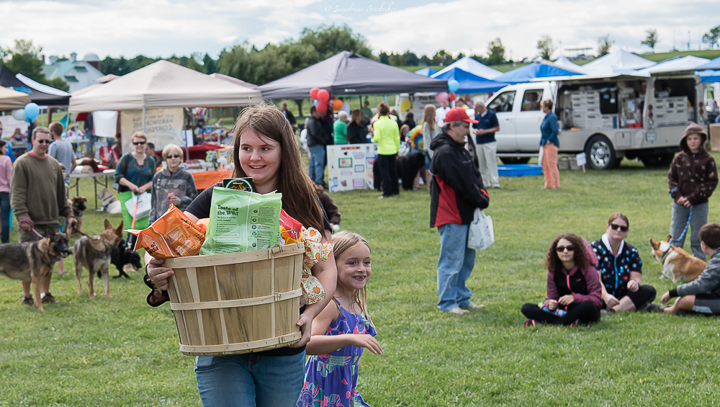 “How are you enjoying the event?” If you are at the Loudoun Pet Expo, ask them if they have been to the Dog Swim, walked the 5K, or seen any of the exotic animals. You can also provide something to DO when your guest arrives at your booth. Some vendors bring a Spin the Wheel game and have prizes. That is always fun and keeps people lingering at your booth. Again, make sure you collect their information so you have names and numbers to follow up with. Vendor events are a great opportunity for positive public relations. Write about the event in your newsletter and post about it on your social media platforms. Take pictures durning the event to post as well. And finally, one of the most important things I can recommend is to get to know your fellow vendors. Oftentimes you are seeing each other at many of the same events. Instead of looking at them as your “competition” ask yourself how your businesses can benefit each other. Maybe a pet sitter has a new client that is looking for a great veterinarian. By getting to know each other, you can also give each other business and referrals. Isn’t that what being a community is all about? So keep your energy up and have fun! I wish you all success and look forward to seeing you in September! Adopt a Pet at the Loudoun Pet Expo →← We have a date!